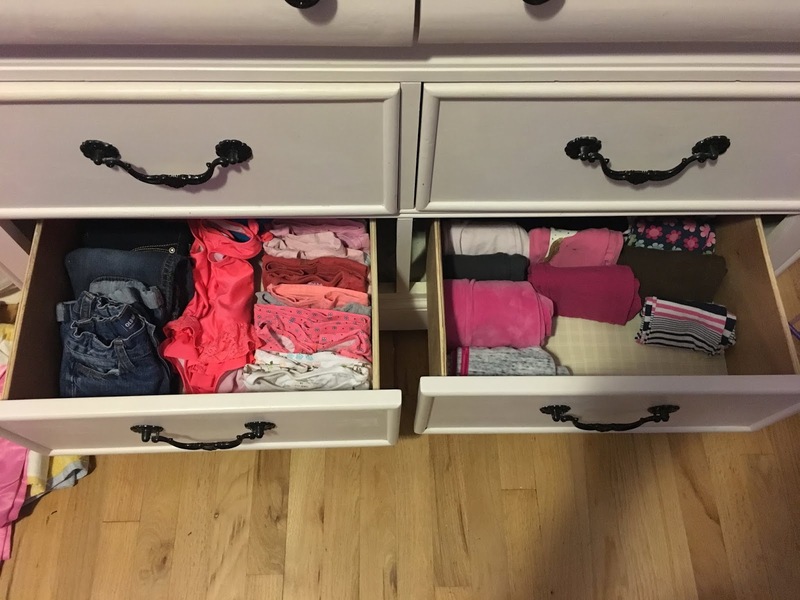 I have been LOVING the new layout of my drawers. I even showed them to my parents on FaceTime because I was so excited about it. 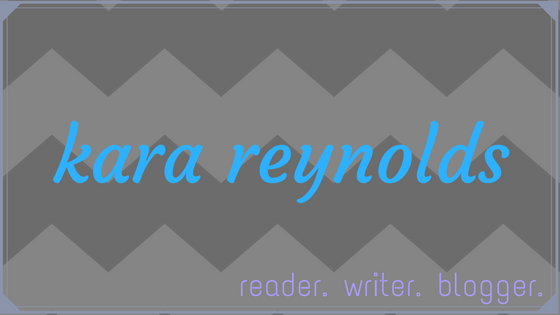 And good news! My husband wants to go through his clothes, too! It's just a matter of finding the time. Maybe when he's finished renovating our bathroom. This week's project: my four-year-old's clothes. Her stuff tends to get jumbled up in her drawers as she tears them apart looking for the specific thing she wants. I'm hoping that with our new way of folding, she won't do that as much because she'll be able to see all of her clothes. 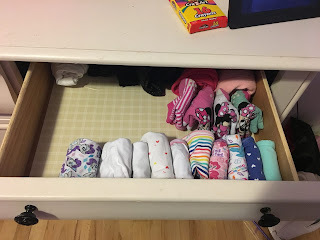 But, she is only four, so I'm prepared to have to redo these drawers a few times. Making the big clothes pile was a lot of fun! We piled her things on my bed. Amelia had a lot of fun going through her clothes with me. She said YES to just about everything, even shirts I know she's never worn because they "aren't pink enough." Some of those yeses I honored, and some went into the donate pile when she wasn't looking. We also found several items that were clearly too small for her and for some reason had never been culled out of her clothes. Her donate pile was much smaller than mine! In the end, we took clothes to the consignment store, Goodwill, and the Laramie Foster Closet, which provides children's clothes to foster families that have an immediate need for clothing. Refolding everything took a while. In the end, though, I got everything to fit. One of her drawers had extra blankets in it, so I emptied that out and used it for some summer clothes that I'd saved because they'll probably fit her next summer. 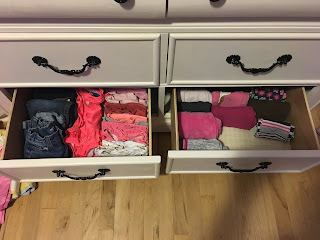 That got the summer clothes out of two drawers in one of the plastic containers in her closet. My goal of eradicating the plastic drawers in my house is becoming closer to a reality. 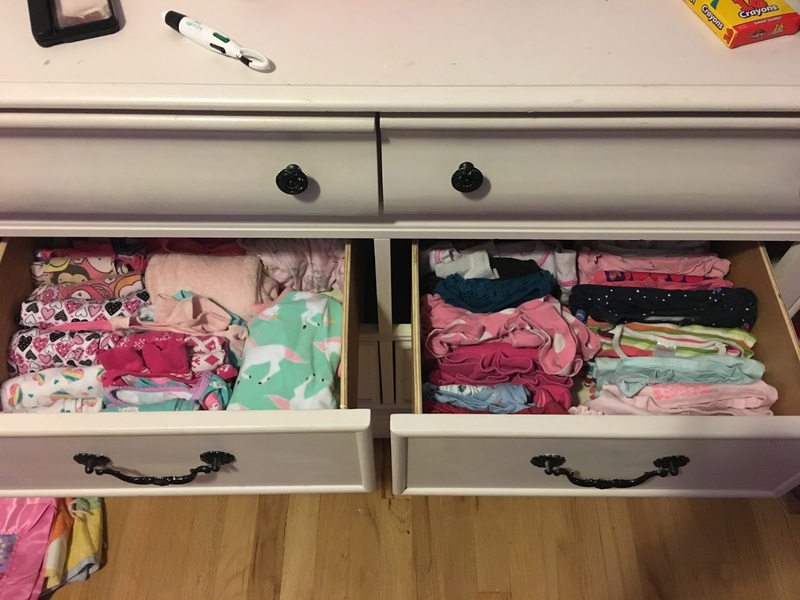 Anyone want to take bets on how long these drawers look like this?